This Rumble ended on 2002-09-01 00:00:00.0. Age: Old enough to know that Tika knows best. Favorite Look: When I come home from a hard day of working outside and Tika gives me "the look". Favorite Music: Kender trail songs and elven love ballads... ok I just made up the elven love ballads thing. Favorite Book: That one over there that stops that table from wobbling. Favorite TV Show: Different Strokes, "What you talkin' bout Willis?" I love that kid, how old is he now? Eight... nine? Favorite Food: Anything that it's plucked from the ground, and could once move by itself. Favorite Modeling Location: The Blood Sea... it's just so turbulent and exciting, plus it makes my hair look fabulous. Age: You're only as old as the girl you're sleeping with. So I guess that makes me 18. Favorite Look: If it's rainy, I'll go right for Blue Steel. If it's sunny, I'm all about Le Tigre. But I think that goes without saying. Favorite Music: I like classical music, especially The Thong Song by Sisqo. Favorite Movie: Anything with John Forsythe in it. The man's the greatest male model who ever lived, and he doesn't even know it. Favorite Book: I just read the first two paragraphs of the novel by Britney Spears and her mother, and it's already my favorite book. Brava! Favorite TV Show: Citizen Kane. I love John Candy. Favorite Food: Anything that doesn't look too gross on the way back up. Definitely not meat loaf. Favorite Modeling Location: The North Pole. I got to meet Santa. Nice guy. One of the few fat people that I didn't find totally disgusting. What's your best feature? : My nose. Or my eyes. Actually, my cheekbones are pretty outstanding. But, honestly, my abs probably get the most attention. Unless I'm in a swimsuit, then my legs. Of course, my hair's nothing to sneeze at. Attention one and all! 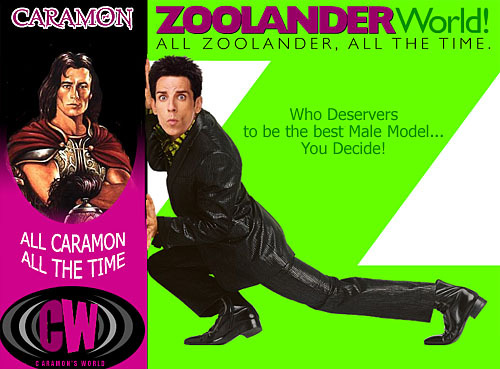 Caramon Majere has been challenged to a walk-off by Derek Zoolander for the title of "Mr. Runway King!". Read all about them! Wanting to start fresh in his life Caramon traveled to Palanthas to start a career in runway modeling. His rugged good looks and natural charm won over the affection of Selenthea Silverdust, a former elven runway model turned manager, and she decided that she would make him the best runway model of all time. It didn't take long for the fashion designers of Palanthas to fall in love with Caramon, he screamed 100% male, and any armor put on his back was sure to sell like hotcakes. Caramon quickly became the jewel of Palanthas and no other male model could touch him. Derek was popular in high school though many described him as "weird," "scary," and "stupid." Because of his good looks Derek made of the cover of his high school yearbook four years in a row. By the nineties, Derek's modeling career was white hot. He became the first person ever to appear simultaneously on the covers of "Forbes," "Time," "The Economist" and "Blueboy." Derek went on to win "Best Male Model" at the VH1 Fashion Awards three years in a row; a feat compared to Michael Powell's long jump record and Antonio Sabato Jr.'s "night of a thousand crunches." As for the future, Derek has sworn he will be the first to runway-walk the Great Wall of China, and then the English Channel.